Members of the E2F family of transcription factors are key regulators of cell cycle-dependent gene expression. Dysregulation of E2F-mediated gene expression has been implicated in the development of several types of cancer, including hepatocellular carcinoma (HCC). However, the molecular mechanisms by which E2F-mediated gene expression programs influence tumor development remain enigmatic. The function of E2F8, an atypical repressor that is highly expressed in HCC, has been explored in cell lines or in other contexts, but its role in cancer development in vivo has not yet been examined. A team led by Alain de Bruin and Gustavo Leone of Utrecht University and the Ohio State University, respectively, now demonstrates that E2F8 functions in the developing liver to suppress HCC. Using mice with a liver-specific knockout of E2f8, the authors determined that E2F8 suppresses both carcinogen-driven and spontaneous tumors of the liver in a cell autonomous manner. Further investigation using temporal-specific ablation strategies, demonstrated that this E2F8 tumor suppression occurs within a relatively short window of time during early postnatal liver development. The multiple functions of E2F8 in embryonic development, hepatocyte polyploidization, and tumor suppression were shown to depend on the DNA binding domain, a module that is essential for regulating gene expression. Consequently, the authors identified E2F8 target genes and found that increased expression of these genes, which would occur in the absence of E2F8 repression, is associated with human HCC. In sum, the data indicate that E2F8-mediated repression of E2F transcriptional output during liver development is a key regulator of HCC development later in life. 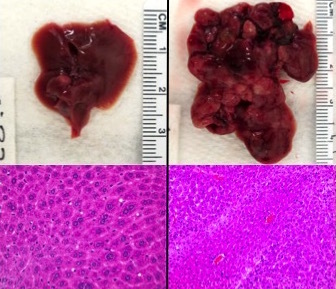 The accompanying images show livers (top) and H&E-stained liver sections (bottom) from 9-month old mice that were treated with the liver-specific carcinogen diethylnitrosamine. The E2f8 genomic locus was either unperturbed (left panels) or ablated (right panels) during early postnatal development. Note the presence of multifocal tumors in the absence of E2F8.